Do you often find yourself being tired, fatigued, low-energy? If the answer is yes than you probably find it hard to focus on your work and you’re unable to find motivation to complete basic, everyday tasks. These kind of states make it almost impossible to do your best in your job, in your training, in your everyday activities, and tackling new opportunities feels to hard to even bother. If you rely on coffee, in the long term you become addicted to it, the effect of coffeine diminishes, and the chronic fatigue accumulates. If this sounds familiar, know that you’re not alone. Feeling tired from time to time is perfectly normal, but statistics show that more than 75% of adults suffer from chronic exhaustion and fatigue as a result of a lack of sleep, improper nutrition, diet and exercise. This affects almost every aspect of their lives and afflicts their health. 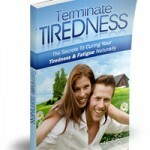 That’s why I was very pleased when few days ago Robert Higgins contacted me to check out his new book which focuses on the issue of tiredness and fatigue and provides a natural approach to terminate it. My energy level is definitely better than it used to be, due to better diet and consistent training, but it’s still not where it could be. By reading his book I realized that there are many more point which I could work on and raise my energy on a higher level. For start let me give you a basic overview of his book and then I’ll point out some things I’ve learned from this course and I plan to improve. Robert realizes that fatigue and tiredness are the result of several combined factors and that’s why he divided his book into several modules and each module deals with one factor. There are also 4 bonuses that accompany his course among which a one-on-one support is probably the most valuable. The course begins with a detailed introduction, in which you’ll learn how to recognize chronic fatigue, how to tackle with it, what you can expect from this course and how to use it in the most effective way. The first module deals with the sleeping cycles. The sleeping process is thoroughly explained and after you read it you’ll know how you can figure out your sleep cycle and thus improve your sleep efficiency. The AHA moment for me was to realize that the majority people needs about 2 hours of deep sleep per night to feel rested the next day. Your body will keep you asleep until you get those 2 hours. The biggest surprise for me is the fact that no matter if you sleep 7 or 12 hours – you will still get only the needed amount of deep sleep. You will get a Sleep Log with this course which will help you track your sleep. If you have an iPhone, there are numerous apps which can make this even easier, Sleep Cycle Alarm Clock is the one I’m using. When you know your sleep cycles, establishing a sleep routine is the next step. In the course you’ll learn how to do this, and find about ways to improve your sleep quality. At the end of module one, there is a list of 12 steps you should take to improve your sleep and you should print this out and keep it somewhere near you as a reminder. Stress is another factor which impacts your sleep quality and second module deals with it. You’ll learn how to identify it and how to let go of stress. In module 3 Robert explains how what you eat also affect your sleep. I already knew about some of the things Robert mentions but I was clueless about some – for example the copper connection with exhaustion and how to deal with it. At the end of this module there is even a seven days meal plan as well as some power drinks recipes. I still didn’t have time to try them, but they really sound healthy and tasty. Module 4 deals with exercise and how it effects your sleep cycle. One of the biggest discoveries for me was the fact that if you’re physically active you actually need less sleep, because exercise prolongs the stages of deep sleep! If you’re not already exercising you should definitely read the suggestions on how to start with your training, how to keep it fun, and how to design an exercise program. In module 5 things to avoid are pointed out. This is the last module and in one way it serves as an additional motivation for you to really implement all those things which were discussed in the previous modules. It also points what you should try to avoid and why (hint – coffee is on the list and after reading all the reasons against it, you’ll probably think twice before drinking it again). Conclusion – Is Terminate Tiredness worth your time? As you probably got an impression, this is a really detailed course, which deals with all aspects of tiredness and fatigue. If you follow it, I’m sure that, not only you’ll raise your energy level, but actually improve the overall quality of your life. I highly recommend you take this steps and improve your life in body, mind and spirit. ps. If you read this far, I presume you’re really interested in taking the most out of this course. Here’s a special deal – on this link you’ll get the chance to try the complete course for 7 days for just $4.95.